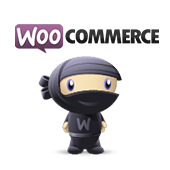 WooCommerce is a great plugin for enabling eCommerce within your WordPress website. It provides great functionality and easy-of-use. One great feature are breadcrumbs. This looks pretty nice. I’ve added some basic styles, but I don’t like the forward slash as my separator. 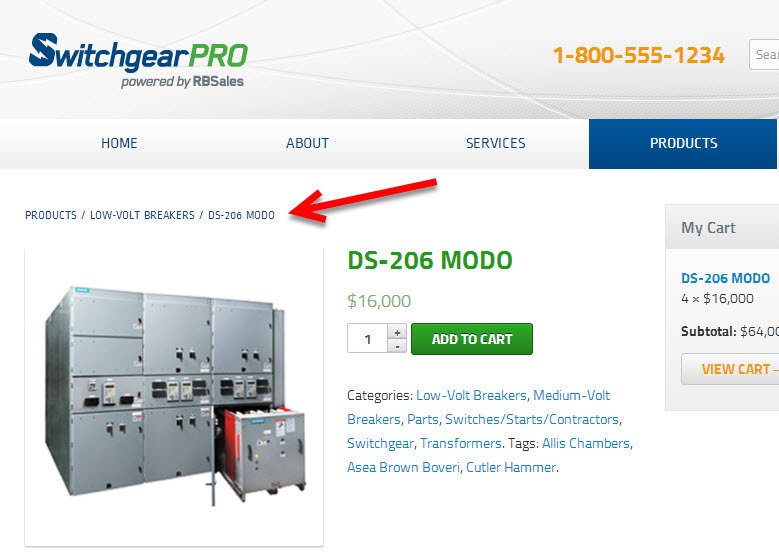 Luckily, modifying the WooCommerce breadcrumb is easy with the use of the woocommerce_breadcrumb_defaults filter. Here’s my end result. Note: I did place a span tag around the separator to provide additional padding between items. With the function above you will be able to add custom classes and modify the elements of the breadcrumbs. You can also change the “Home” text and add elements before or after the breadcrumb. 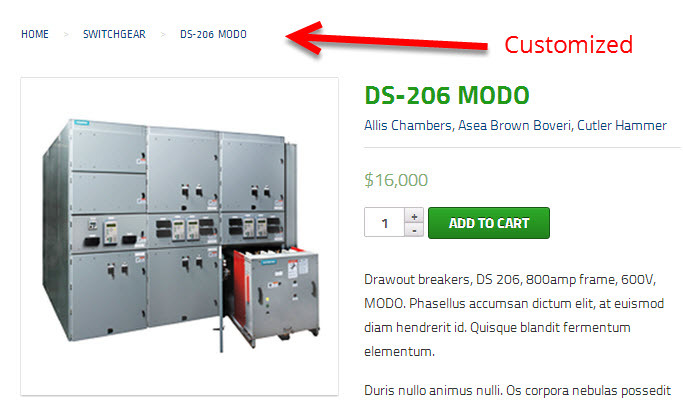 Nice little function here to customize the WooCommerce breadcrumb output and functionality. 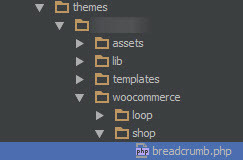 Depending on your need, some of the following functions may be useful for your WooCommerce breadcrumbs. …and you can customize the logic all you want without having to worry about updating the plugin. If you have a WooCommerce breadcrumb issue/need that hasn’t been resolved by the solutions above please leave a comment below. If this has resolved your needs and you want to give a shout out you can leave a comment too! Thank you for the woo tips 🙂 Clearest explanation on the web. I appreciate you taking the time to put it out there. It helped me out with my current project. No problem! Glad it help your Patrick. Is there any way to assign a second navigation menu in the breadcrumb section? Hi, I’m using mystile theme (woo theme) and wooCommerce but i cant get my breadcrumbs to show? Never touched anything, any clue why they would not show? Here’s the site autoteile-bg.com. Thanks! How can I add a second set of breadcrumbs at the bottom of product pages? All you have to do is uncheck the main category on the page of your product and leave the subcategory checked. Your subcategory will automatically be included with your parent or main category by default. Worked for me. I’m setting up a store for a record label. I have added all products as variable products as for most releases we have the option to purchase cd/vinyl or digital. I have set the formats as categories (so CD as one, Vinyl with subcategory 12″ & 7″, and Digital with subcategory MP3 & FLAC). The breadcrumb in Woocommerce always defaults to shop>digital(category)>Mp3(subcategory)>artist name- artist release(product) when you view a product. I guess this i perhaps a limitation of using variable products and the breadcrumbs in woocommerce? Can i therefore edit the breadcrumb so it would just display home>shop>artist name – artist release (product)? or would you suggest if there is a better way to solve the issue? Could i set it up so it displayed home>shop>artist>product name? Same issue for me. Any fix for this? I think i ended up changing my permalink structure, so that now i have a shop main page, then the products archive then the releases. This resulted in having a breadcrumb format of home>releases(products)>artist(category)>release. Not sure if that helps you, but thats how i got around it. hi man I just want to show the current page in the breadcrumb, how can I do? How can i take the rel=”v:child” in all breadcrumbs -Tags without the Home Breadcrumb. 2. In the wordpress -> settings -> permalinks. Changed ‘Product permalink base’ to custom, and entered: “/gallery” . (I don’t recommend to anyone to change their permalinks without understanding what they do… especially on live sites). Hi, in my breadcrumb i would like to highlight the parent category of the product page I’m visiting. e.g. in “Home > boats > wood boat” how to highlight “boats”? I’ve been overwriting css breadcrumb for some time now and can’t make it work. Any help appreciated. Thank for your article. Can I change this to just show the tag name and delete the “Products tagged” part? Please see http://www.pocketsqua.re and click on one of the icons at the top of the front page to see. is it possible to compliantly remove the SHOP from the breadcrumbs ? Hi, found this tut in a Google search. I wanted to learn of how to move the breadcrumb nav. By default it displays before page title. I want it to display after page title. Can you show how, in case you’re still checking this thread? Thanks. Hello Devin… I am using woocommerce canvas. My webpage URL is http://www.osteodoc.com. I want to narrow the space that the breadcrumbs reside in. Any way to do that? Thanks. to remove breadcrumbs on the Shop page (there are none on the other pages), and I’ve tried similar pieces of code I’ve found here and there. Nothing works. Can somebody help? Thanks. In a site now in development, I’ve tried “remove_action( ‘woocommerce_before_main_content’, ‘woocommerce_breadcrumb’, 20, 0);” to remove breadcrumbs on the Shop page (there are none on the other pages), and I’ve tried similar pieces of code I’ve found here and there. Nothing works. Can somebody help? Thanks.